The most efficient and cost effective heavy duty, easy to use, turbine drive MEDIUM size soft hose travelling irrigator with FREE 200 m of 2.5" made in Norway drag hose. High efficient turbine: Depending on the water volume and pressure the turbine nozzle can be easily changed without tools.Delivers high torque at low RPMs even near end of run. Sensitive speed control: Extremely wide range of speed for any crop and application. Portable: The DuCaR IrriCruiser is ideal for irrigating widely scattered areas. They can be towed from field to field or farm to farm. Excellent Water Uniformity: The continuous movement of the sprinkler and traveller irrigator provides a perfect uniformity and even water distribution. Long Life & Simple Maintenance:The units are built from long life components and require a minimum of maintenance. Spare parts and backup service available. Very low labour requirement: The DuCaR IrriCruiser can easily be operated by one man and the labour consists mostly of driving a tractor. The turbine provides the high torque to pull the DuCaR IrriCuriser & Hose along the cable in tough conditions. DuCaR IrriCuriser develops the power as a result of water flow, not pressure. Therefore it can be operated at low pressures. Our PATENTED by-pass line system allows you to adjust the water flow rate in the turbine. Therefore, you can simply adjust the speed and run the machine only required amount of water flow rate. The volume of water entering the turbine is controlled by a diverter valve, which when used with the three speed gearbox, provides the DuCaR IrriCuriser with infinite range of travel speeds to suit differing crop water requirements. The travelling speed is read on accurate tachometer. No filters required for the turbine drive. No exhaust water from the turbine drive, all water is distributed through the sprinkler. Established in 1981 and headquartered in Turkey, is one of the leader irrigation sprinkler manufacturing companies in the world. 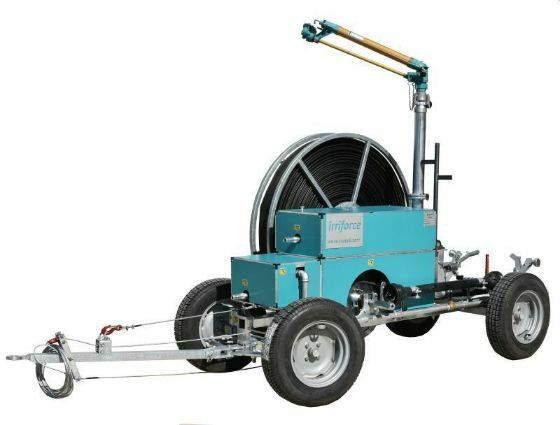 It offers products and services ranging from gear driven, impact irrigation sprinklers, connection stands, pumps, and complete irrigation system design. Since agricultural and industrial irrigation needs vary for different environmental effects, producing only couple of different types of sprinklers does not meet the all requirments in different regions and countries. Hence why DuCaR Sprinklers offers custom designed sprinkler systems to meet all farmers' requirements around the world. Its fully automated latest technology manufactirng system, CNC machines and CAD & CAM software systems enable them to produce accurate and defect free products. DuCaR Sprinklers works with farmers and scientists around the world to improve irrigation systems' quality to promote sustainable agriculture with best prices. These irrigation calculators will help compute your irrigation needs based on your growing practices, types of soil, and vegetation. Drip Line Application Rate: Water application rate of drip irrigation. Sprinkler Application Rate: Application rate based on nozzle diameter and spacing. Water Application Rate: Water application rate from a given flow and area. Nozzle Requirements: Find the flow rate using a given pressure and diameter, or find the nozzle diameter for a given pressure and flow rate. Pipeline Size/Pressure Loss: Calculate the pressure loss in a pipe with evenly spaced outlets, such as a sprinkler lateral or a manifold, or minimum pipe size in the same based on the maximum allowable pressure loss. Irrigation Frequency: maximum interval allowed between irrigations. This is dependent on soil type, root zone depth, and the water use rate of the crop. Set Irrigation Times: set time required to fulfill a given water application, irrigation area, and flow rate. Water Depth: Depth of water applied to a specified area over the specified time span based on the given flow rate. Water Application Rate: Application rate using the flow rate on an area. Drip Line Rate: Water application rate of drip lines. Drip Design for Landscapes: Determine how much water to apply to individual plants with drip emitters. Nozzle Flow Rate and Effective Application Rate: Sprinkler nozzle flow rate and effective application rate based on nozzle diameter and spacing. Nozzle Flow Rate and Required Nozzle Diameter: Sprinkler nozzle flow rate and required nozzle diameter based on target application rate and spacing. Lateral Friction Loss: Find the flow rate, pipe length and friction loss based on a sprinkler lateral. Hand Move Sprinklers: Find recommended values for hand move sprinklers, such as set times, nozzle and pressure losses. Sprinkler Density: Find the number of sprinkler heads per area for rectangular or triangular spacing. 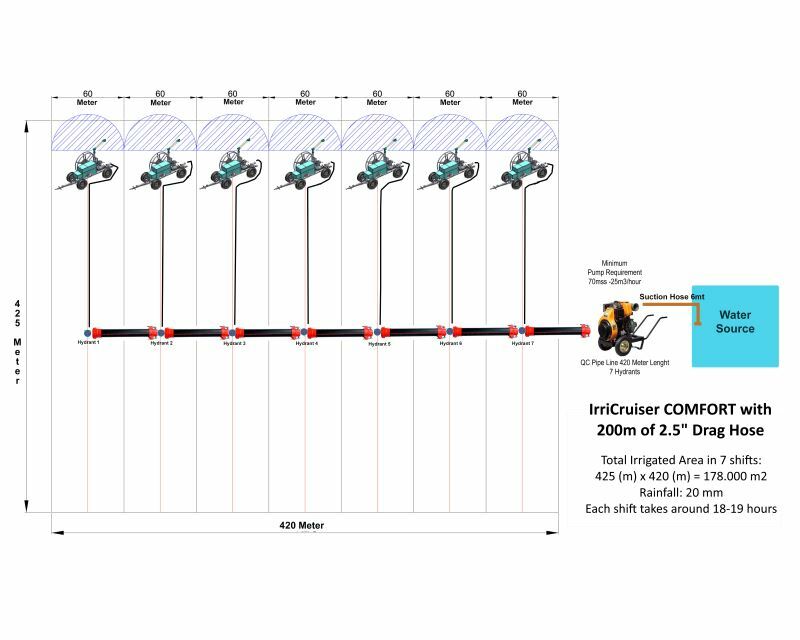 Traveling Big Gun Sprinkler: Calculate the net water application for a given flow rate, efficiency percentage, lane width, and travel speed. Traveling Irrigator: Estimate the the total number of irrigated acres per hour based on lane spacing and travel speed. Percent Timer Setting: Use this calculator to calculate an approximate timer setting to apply a particular depth. 1" Application Time: Calculate the irrigation time to apply one inch of water with a center pivot. Center Pivot Acreage: Calculate the area underneath a center pivot. Pivot Full Rotation Time: The time that it takes for a 360 degree rotation of a center pivot. System Pumping Requirements: Calculate the system capacity (flow rate) required to meet the demands of a field. Garden Hose Flow Rate Calculate the flow rate and application time for a garden hose, based on hose size and supply pressure. Lawn Water Management Find the application depth and operation time for a specific grass type, precipitation rate, and daily water use. Also provides suggested application depths and operation times for multiple water periods. Irrigatable Area: The land area that can be irrigated with a given flow of water. Irrigation Frequency: The maximum interval allowed between irrigations. Irrigation Run Time: Determine the length of time that an irrigation system must run to apply enough water to replace the water lost to evapotranspiration. Required Water Pump Horsepower: Estimate the brake horsepower and total power (hp) requirements of the electric motor used to power an irrigation water pump. Irrigation System Pumping Requirements: Calculate the system capacity (flow rate) required to meet the demands of a field. NPSHA: determines the absolute pressure at the pump impeller. Total Dynamic Head: This calculator finds the pressure required at the pump, and the head that the pump must generate. Minimum Required Pipe Size: Determine required pipe size based on given flow rate, pipe length, material and maximum allowable pressure loss. Pipe Velocity and Diameter: Calculate the velocity of water in a pipe and calculate the diameter of a pipe required for 5 fps pipe velocity. Pipeline Pressure Loss: Calculates the pressure or friction loss along a given length of pipeline with a specified inside diameter and the minimum pipe size to limit pressure loss to a specified value. Pressure Loss from Laterals with Outlets: Calculates friction loss in a pipe with equally spaced outlets and the minimum pipe size for a pipe with equally spaced outlets. Fitting Pressure Loss: The equivalent feet of pipe to add to the pressure loss equation. Required System Capacity: Calculate the system capacity (flow rate) required to meet the demands of a field. Water Application Rate: Water application rate using the flow rate on an area. Water Depth: Depth of water applied to a specified area over the specified time span based on the given flow rate onto the field. Total Surge Pressure (Water Hammer): Surge pressure due to a sudden shutting of a valve, or water hitting the end of a pipe. Water Supply Design: Estimate of the water flow requirements to replace water lost to evapotranspiration.